Peachcrest Elementary teacher graduates from Education Policy Fellowship Program. Michelle Simmons, 5th grade special education teacher at Peachcrest Elementary, completed the Education Policy Fellowship Program (EPFP). 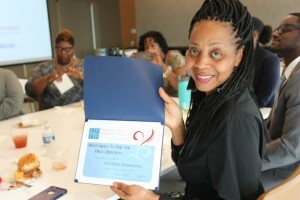 Michelle Simmons, a fifth-grade special education teacher at Peachcrest Elementary School, was one of 21 graduates of the ninth Education Policy Fellowship Program (EPFP) class. Simmons also serves on the Board of Education in Douglas County, where she resides. She said the program was beneficial. The program is composed of monthly colloquiums and attendance at a national leadership conference in Washington D.C. Speakers include leaders in a wide variety of subjects including funding, global and higher education, school choice, early education, politics, the demographic landscape and more. Simmons said she would recommend the program to others. *Editor’s note: This posting is heavily based on a press release submitted by the Georgia Partnership for Excellence in Education.